Mason Jones made a field goal with 22 seconds remaining to give Arkansas a 90-89 victory against LSU at the PMAC on Saturday evening. The Tigers wiped out an 18-point second half deficit to take an 85-84 lead on a basket by Javonte Smart with 3:41 remaining in the game. There would be five lead changes during the rest of the game with Arkansas coming out on top. Two foul shots by Isaiah Joe put the Hogs on top 86-85. On LSU’s next possession, both Smart and Emmitt Williams made one of two free throws which left it ahead 87-86 with 3:19 to play. A field goal by Daniel Gafford on the Razorbacks’ next possession gave them an 88-87 lead with 3:01 remaining. Both teams struggled to score over the last three minutes. The Tigers scored points on just one of their next four possessions – two foul shots by Smart with 2:01 remaining – to put them ahead 89-88. Waters and Smart missed 3-point shots. Waters made an ill-advised pass as he tried to hit Marlon Taylor on a lob with 36 seconds to play. That turnover led to Jones’ game-winning basket in the lane. LSU had three shot attempts on its final possession. Naz Reid missed on a drive to the goal and Smart failed to connect on a short jumper. Reid then missed an off-balanced 3-point shot at the buzzer. Smart played a crucial role as the Tigers came back from a 66-48 deficit with 13:44 remaining the game. 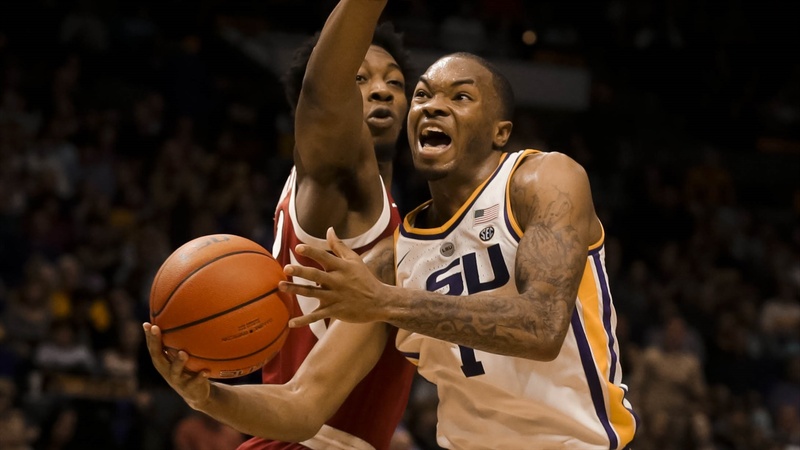 Smart scored 13 of his 17 points as LSU made its comeback. His field goal with 3:41 to play gave the Tigers their first lead at 85-84. Then, Smart sank two foul shots with 2:01 to play to give LSU its last lead at 89-88. Smart was 5-of-12 from the field and 7-of-8 at the foul line as he scored 18 points. Smart, who missed four of his five 3-point shots, had three rebounds and two steals in 31 minutes. LSU’s starting lineup consisted of Bigby-Williams and Reid in the post, Mays and Taylor on the wings and Waters at point guard. Bigby-Williams was on the floor for only 17 minutes. Four players logged more than 30 minutes – Mays (37), Waters (34), Reid (33) and Smart (31). . .Reid had a solid game except for his five turnovers. He was 5-of-9 from the field and 8-of-9 at the foul line. The double-double was Reid’s second of the season. He had 19 points and 12 rebounds against Louisiana-Monroe. . .Mays had another game in which he was unable to shoot well from behind the 3-point line. He was 2-of-7 on 3-pointers. Mays has missed 24 of his last 30 3-point shots – a span of five games. He had a team-best three steals. . .Waters also had problems shooting the deep ball as he was 1-of-6 from behind the 3-point line. He also missed four of his six two-point field goal attempts. Waters committed five of LSU’s 21 turnovers – a season-high. The Tigers turned the ball over 19 times in the first game against the Razorbacks. . .Bigby-Williams was 4-of-5 from the field. . .Taylor played just 18 minutes and finished with six points and three rebounds. . .Days missed his four field goal attempts, three from behind the 3-point line. . .Williams had seven points and four rebounds in 17 minutes. . .Gafford had his way once again against the Tigers. Gafford, who scored 32 points in the first game, was 11-of-15 from the field before fouling out in the final minutes. . .Embery-Simpson, who made four 3-points shots, was averaging four points per game. He had made 14 3-point shots in the Hogs’ previous 20 games. . .Joe was 4-of-8 on 3-pointers. . .Arkansas, which made 54 percent of its 3-point shots, entered the game shooting 33 percent from behind the arc. . .The Hogs scored 13 straight points in the first half to build a 20-11 lead. The Tigers finally tied the score at 34-34 on a basket by Bigby-Wiliams with 3:25 before halftime. Arkansas took a 45-41 lead into intermission. . .The Razorbacks outscored LSU 21-7 in the first 6½ minutes of the second half. Both Joe and Adrio Bailey scored five points in that stretch for the Hogs. The Tigers made only three field goals in that span. . .LSU still trailed by double digits at 79-68 with 7:18 to play. The Tigers then went on a 17-5 run to go ahead by one point. Smart scored six of those 17 points. . .The loss ended LSU’s 10-game winning streak and its seven-game SEC winning streak. The defeat was also the Tigers’ first at the PMAC in 19 games. . .LSU is 17-4 overall, 7-1 in the SEC. Arkansas is 13-8 overall, 4-4 in the SEC. . .The paid attendance was 13,311 – a sellout. The actual crowd was more than 12,000. LSU will play Mississippi State at Humphrey Coliseum in Starkville on Wednesday. Tipoff is scheduled for 8 p.m. Central. The Bulldogs (16-5, 4-4) beat Ole Miss 81-75 in Oxford on Saturday afternoon. The LSU-Mississippi State game will be available on ESPN2.